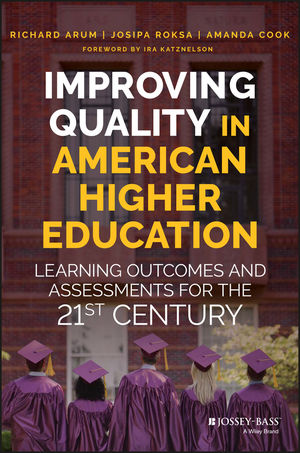 Improving Quality in American Higher Education outlines the fundamental concepts and competencies society demands from today's college graduates, and provides a vision of the future for students, faculty, and administrators. Based on a national, multidisciplinary effort to define and measure learning outcomes—the Measuring College Learning project—this book identifies 'essential concepts and competencies' for six disciplines. These essential concepts and competencies represent efforts towards articulating a consensus among faculty in biology, business, communication, economics, history, and sociology—disciplines that account for nearly 40 percent of undergraduate majors in the United States. Contributions from thought leaders in higher education, including Ira Katznelson, George Kuh, and Carol Geary Schneider, offer expert perspectives and persuasive arguments for the need for greater clarity, intentionality, and quality in U.S. higher education. Improving Quality in American Higher Education: Learning Outcomes and Assessments for the 21st Century, eds. Richard Arum, Josipa Roksa and Amanda Cook (San Francisco: Jossey-Bass, 2016).